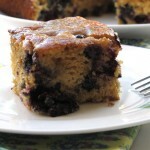 Melissa Clark’s Maple Blueberry Tea Cake or was that Pan-Cake? A super simple quick bread bursting with blueberries and sweetened by maple syrup - if you close your eyes, you will think you're eating a blueberry pancake. Preheat the oven to 400 degrees F. Lightly grease an 8-inch loaf pan or 8-inch square cake pan. In a large bowl, combine the dry ingredients -- flour(s), baking powder, baking soda, and salt. In a medium bowl, whisk the wet ingredients -- the maple syrup, egg, milk, and melted butter. Pour the maple syrup mixture into the flour mixture and fold together until just combined. Gently fold in the blueberries. If using the glaze, add the maple syrup, butter, and salt to the small saucepan set over medium heat and stir until combined, then add the sugar and cook until it is dissovled. Pour the warm glaze over the cake, letting the excess glaze drip onto the baking sheet or serving platter. Slice and serve.